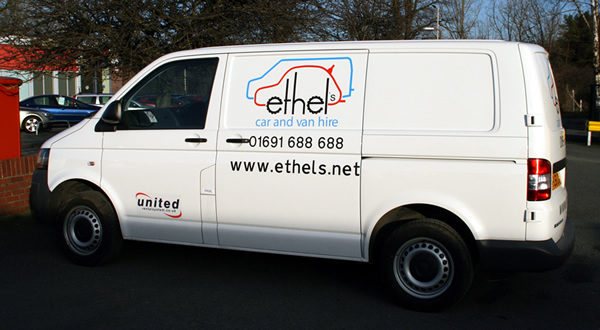 VW Transporter Van for Hire from £30 – Van Hire Oswestry by Ethel’s. The VW Transporter is the smallest van in our hire fleet, it is ideal for everyday use, such as collecting items of furniture, or flat pack storage products, or collecting a load which is too big for a family car. This vehicle is available to for either short or long term hire, with our daily rate for hire for this vehicle as little as £30 for a half day (See our Price List for Details), which includes Comprehensive Insurance, Breakdown Cover and VAT. Please Note: The vehicle referenced above is provided as an example. Specific models within a van class may vary in availability and features such as passenger seating, luggage capacity and engine performance – See Van Hire Options for details.